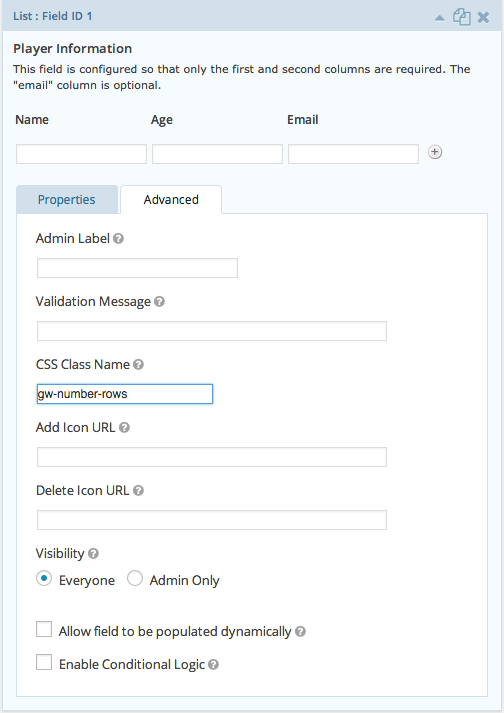 Here’s a quick bit of CSS that will automatically number your Gravity Forms List field rows. It does this using CSS psuedo elements within each row to add a “number” column. To install this snippet, copy and paste the CSS code to your theme’s style.css file. Then on any List field for which you would like to number the rows, just add the gw-number-rows class to the field’s “CSS Class Name” setting. This will work in all modern browsers and IE9+. Depending on your site’s styles, you may need to adjust the margin and width set in the CSS snippet. Experiment! If this helped you, let us know in comments! If you use this in the wild, share a link so we can see what you’ve done with it. Would this work with PDF output? Unlikely. You would probably need to include the styles in the PDF generator (assuming it provides a setting for custom CSS). Hello David, is there any way numbering the entries in gravity view like 1. David (first approved entry) 2. Alper (second) 3. …. (third) 4. …. Hi Alper, this solution does not apply to Gravity View. I’d ping their support to see if there’s an existing solution. Thank you so much for all the material you create. I’m having a small issue with this snippet. Namely, I can’t get the numbers to increase sequentially. It’s just 1,1,1,1,1,1. I thought might be to do with the fact I have this plugin https://wordpress.org/plugins/gravity-forms-list-field-select-drop-down/ installed and was using in the relevant list field. However, I removed the dropdown, deactivated the plugin, and got the same result. I hope I’ve not made any silly errors here, and apologies if so. I would really appreciate your advice! Thank you very much. Best, A. Do you have a URL where I could view the form? Thanks so much for this snippet! It adds a nice bit of polish to a form I’m building. Our pleasure, Daniel. Glad you enjoyed it. Hi, can I display the total number of rows with a merge tag in another field? Would it be possible to have a list field with two columns and then populate the first column with numbers same way as the above snippet does, but inside the input field instead? I’m new to GF and what a great ressource this site is! Hi Lars, glad you’re finding the site useful. Unfortunately, I don’t have a ready solution for populating the number into one of the columns of the List field. Thanks for the prompt response. I actually thought that it was a pretty simple thing to do using “dynamic population” one way or the other, and that the solution above was of the more advanced type. As an alternative, using the above solution, are the numbers for each row then included in any submission of the form? Hi Lars, it is possible to dynamically populate the List field inputs. If you ping Gravity Forms Support they’ll be able to provide instructions on how you might do that. The issue, I suspect, is that when you dynamically populate a List field, it adds the rows automatically. If you want the number to be dynamically generated when a new list field is added, dynamic population probably won’t work. Right ok, well I managed to get a slution working with a little help from a developer and jQuery. It’s perhaps not perfect, but gets the job done. Hi. I’m doing a list of item using Gravity Form. In the end of the list or after the list, I want to display the number of rows that user has created. Hi Adlan, do you have a visual of what you’re trying to achieve? Thanks for the link David! Do you still do commissions for features? If so, I was wondering how much you would quote for the list field conditional logic thing. Hi Catherine, I sent you an email on Feb 26. Let me know if you did not receive it. I sent you a reply to your email on the 26 Feb, at 16:37 – just assumed you were catching up on a backlog or something! Let me know if you can’t find it and I’ll resend it. Hi Catharine, yeah, not seeing your reply. I just replied again in the same thread. If you’d like to reply again and confirm here, I’ll make sure I got it. Hi David, I just sent you the email again (to your david@gravitywiz.com account). Cool snippet! As an aside though, how did you configure that list field so that only the first two columns were required? And also, I understand that at present, you can’t use the inputs within a list field in conditional logic for other fields. Do you have or are you planning to bring out a perk to get around this? I do not currently have plans for List-field-based conditional logic.